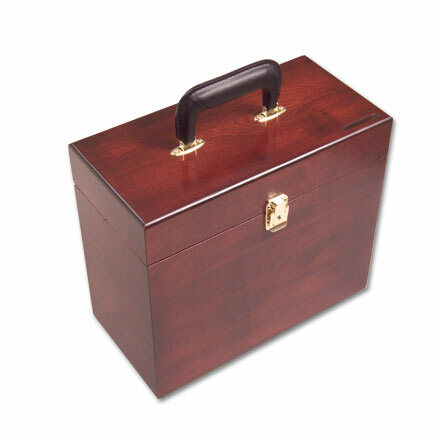 Insurance File Box | Custom wood boxes and cases. Made in the USA. Ever so quietly, the company that specified this cherry finished File Box was a smart marketer. Wanting to be seen by clients as serious, thoughtful and steadfast, they delivered their documents to clients in this beautifully crafted document storage box. Dovetail joint construction emphasizes quality, and in turn, the quality of the insurance services provided. 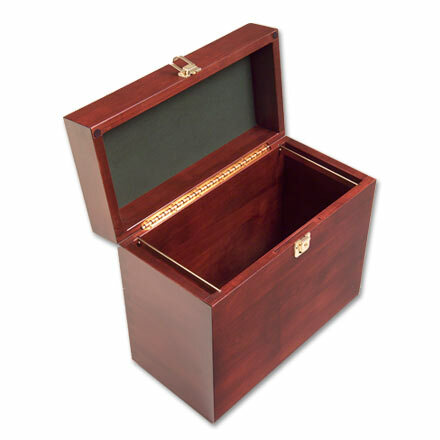 Brass rail inserts and hinges make it a functional organizer and the leather handle with matching lock and hardware make it a completely functional and intelligent custom box for document storage and presentation.